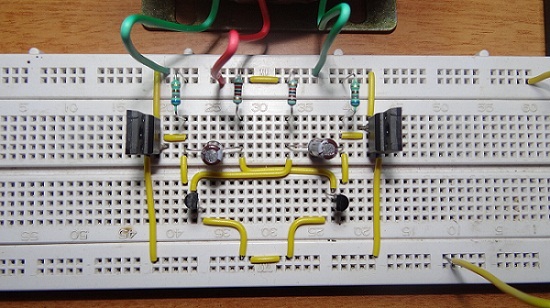 A 12V DC to 220 V AC converter can also be designed using simple transistors. It can be used to power lamps up to 35W but can be made to drive more powerful loads by adding more MOSFETS. The inverter implemented in this circuit is a square wave inverter and works with devices that do not require pure sine wave AC. The Power Converter can be divided into three parts: oscillator, amplifier and transformer. A 50Hz oscillator is required as the frequency of AC supply is 50Hz. This can be achieved by constructing an Astable multivibrator which produces a square wave at 50Hz. 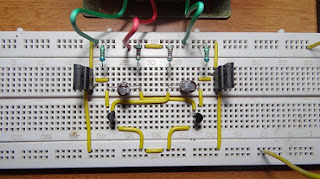 In the circuit, R1, R2, R3, R4, C1, C2, T2 and T3 form the oscillator. 0 Response to "Inverter Circuit- 12V DC to 220V AC Power Converter,Mosfet Inverter"